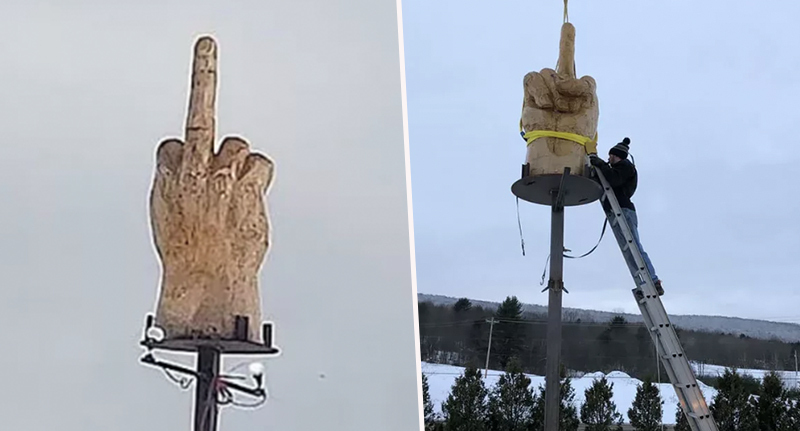 There’s not liking where you live, and then there’s spending $4000 on a statue which allows you to give the entire town the middle finger. Which is exactly what Ted Pelkey from Westford, Vermont did. Apparently his regular-sized hand just wouldn’t have effectively got the message across, so the determined man commissioned the statue to stand over the residents like a disheartening version of the Angel of the North or the Statue of Liberty. His decision to flip off the entire town came after a 10-year battle to get a permit which would allow him to build a garage. The middle finger is actually directed at town leaders including Westford Selectboard and Development Review Board, who were behind the blocking. Everyone else who can see the finger is merely an unfortunate additional recipient of the statement. Pelkey was hoping to build the garage so he could move his truck repair and recycling businesses from nearby Swanton to his own property. 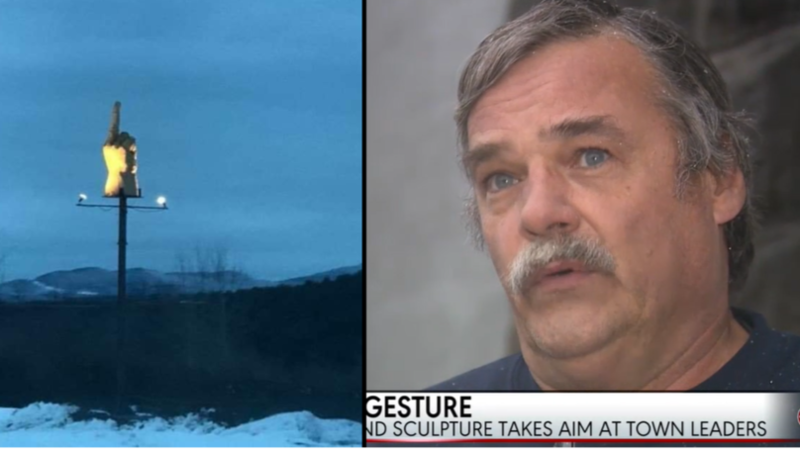 In order to tell the authorities exactly what he thought of their decision, Pelkey commissioned the statue for $4000. It’s made of a 700 pound block of pine, and stands on top of a 16-foot high pole. I’ve been put through the wringer by these people, and it’s just not right. I haven’t been treated fairly at all. I was sitting at a bar and said to my wife, ‘Hey, I want to get a statue made of a middle finger, and I’m going to put it up on the lawn’. The disgruntled man has surrounded the finger with floodlights so it’s visible at all times of the day and night, serving as a constant reminder of how the officials crossed him. You’d think there’d be something standing in the way of Pelkey’s plan to swear at the town, but the statue simply exercises his right to free speech, meaning there’s no law against it. It was critical to me to make sure that my neighbors and the people who live in this town understood that I didn’t put that up there for them. It is aimed directly at the people who sit in our town office. I’m not trying to cause hate and animosity to the people who live in that town, because there’s very good people in that town. All the people are very good people. With the exception, of course, of the town leaders who fought him on the garage. If you don’t want to look at the [garage], look at this. The owner has no plans to take the statue down any time soon, and rather hopes some good will come from the way he has shed light on the dispute.